And you just know this movie has to bug at least some Japanese fans. They created the giant robot genre with Tetsujin 28-go and Mazinger Z, and successfully combined it with their already-popular “daikaiju” (giant monster) genre. There were few things as awesome to young Poe as Mechagodzilla, but of course Mechagodzilla had predecessors such as Giant Robo and even Ultraman (who, let’s face it, looks like a robot, even if he’s technically living being). But Japan’s film business has never been able to throw as much money at their live-action movies as the United States. And so it falls to Guillermo Del Toro, director of Hellboy and Pan’s Labyrinth, to create the giant robots vs. giant monsters blockbuster fans on both sides of the Pacific Rim have been waiting for. The giant robots are called “Jaegers” (YAY-gers) in the film. Jaeger is the German word for “hunter,” and also the name of a North American seabird. (Frat boys may also associate it with a certain digestif.) Each Jaeger has a unique two-word callsign. America’s robot is called Gipsy Danger and yes, that spelling is correct. Using the “i” instead of a “y” is a British spelling variant, which for some reason was used for an American robot. I’m pedantic enough that it annoys me a little, but in the movie the director of the Jaeger program is British, so maybe that’s why. 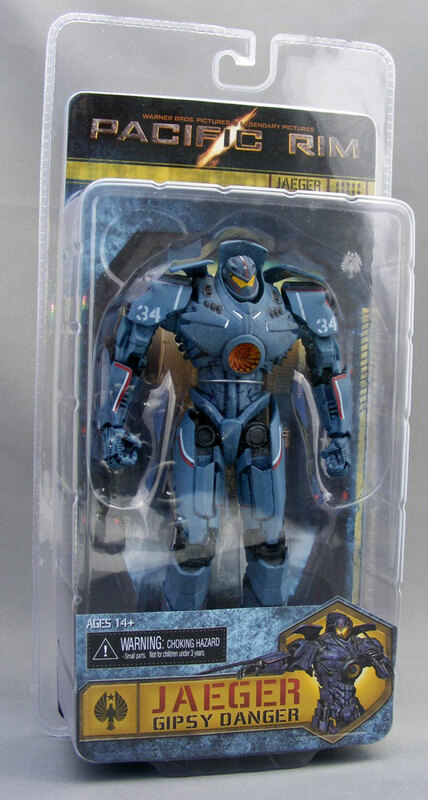 NECA has secured the action figure rights for Pacific Rim, and they’re starting out with three 7″ figures – Gipsy Danger, another Jaeger called Crimson Typhoon, and a kaiju called Knifehead. The second series (due in September) will include a battle-damaged Gipsy Danger with extra weapons, a Jaeger called Striker Eureka, and an ape-like kaiju called Leatherback. 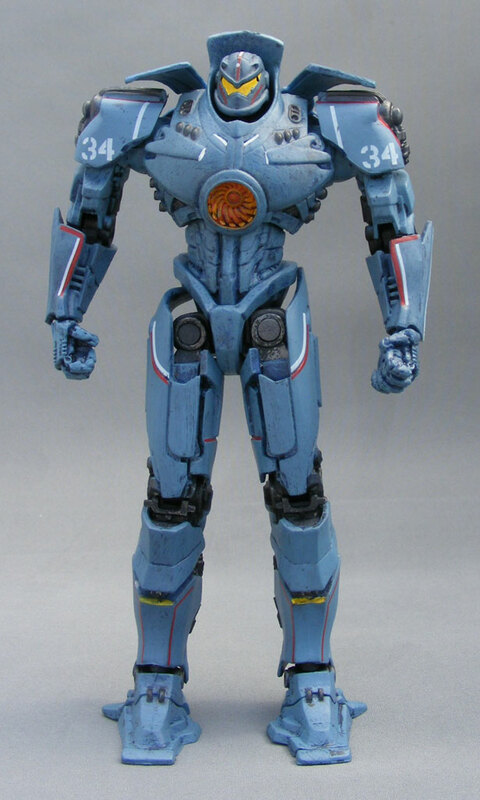 There will also be an 18″ Gipsy Danger with light-up features and a weapon accessory. Packaging: The figure comes in NECA’s usual clamshell packaging. The cross-sell graphics on the back are of the figures themselves, which I often find a bit disappointing these days – I prefer to get pics from the movie, or maybe some art. Fortunately, the front insert features concept art of Gipsy Danger from the film. 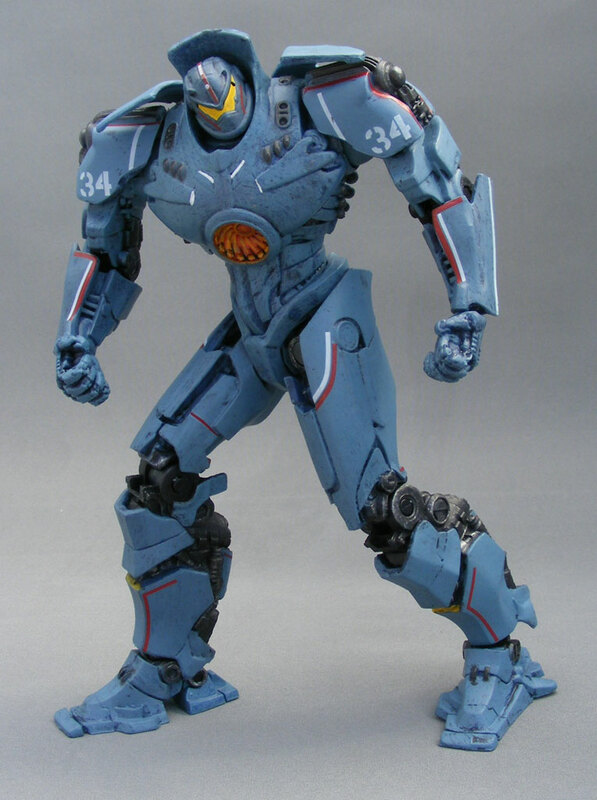 I’ve found Gipsy Danger to be the least interesting Jaeger design, but that may be intentional. With her all-American football player looks and strongly humanoid structure, Gipsy Danger is the “everyman” of the Jaegers. She’s generic-looking so that it’s easier for the viewer to identify with her. The sculpt of the NECA figure is a mixed bag. According to Randy Falk of NECA, the Pacific Rim figures were created by “digital outputs supplied to us through Legendary and ILM — then we articulated by hand and cleaned up and refined some details.” But the sculpt is a bit soft and lacking in detail, and I suspect this is partly due to being designed from computer models. Since the early days of using computer scanning and models for toys, companies have learned to have human sculptors touch up sculpts for that reason, and Falk even mentions that. Nonetheless, Gipsy’s sculpt still seems a bit bare. However, I like the somewhat toy-like feel of this figure. It’s appealing in a way that brings me back to previous eras of toy collecting. Holding the figure may remind you a bit of McFarlane Toys’s heyday in the late 1990s and early 2000s – it feels a bit like the stuff from that experimental era when McFarlane made Nitro Riders, Techno Spawn and Interlink 6. 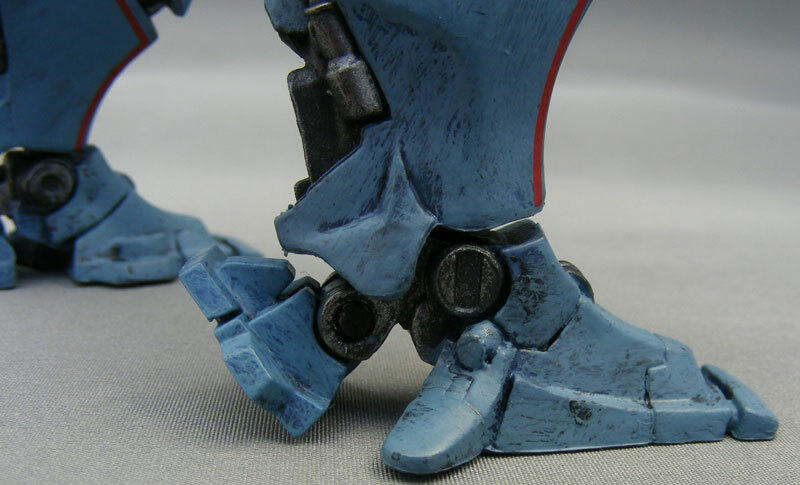 Plastic & Paint: First, the good: I like the paint work on the “steel” parts, such as the inner hips and behind the knees. It’s silver with a black dry-brush that will remind you of the aforementioned Spawn figures, or perhaps some of N2 Toys’ Matrix stuff. Unfortunately, the rest of the paint work is just plain bad. I don’t mind the blue used for the body, but the dry-brush work that’s supposed to give the figure a “weathered” look is amateurish. The white and red detailing are applied in bright, thick, sloppy lines. We were seeing better paint work than this in the late 1990s. I seriously don’t know what happened here – NECA is better than this. Articulation: Despite the bad paint, it’s the articulation that seems to be the biggest point of contention for collectors. Many seem to have expected the kind of super-articulation NECA has been putting on their Aliens and Predator figures lately, while S.H.MonsterArts fans seem to want the same articulation they’re used to on those figures – despite these toys costing a fraction of the price of SHMA. 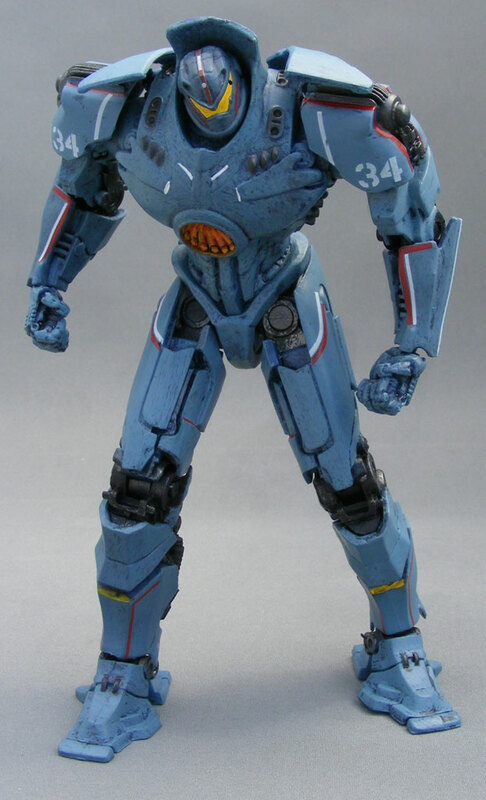 Gipsy Danger features a ball-jointed head, ball-jointed shoulders, hinged elbows, ball-and-socket wrists, a ball-jointed torso, ball-jointed hips, hinged knees, ball-and-socket ankles, and an odd hinge at the heel, which allows the heel to go up and backwards in a very non-anthropomorphic manner. If I may digress a moment, I think there’s this perception that I’m obsessed with articulation and am always disappointed if the figure doesn’t have a few dozen joints. There’s a kernel of truth to that, but it’s more accurate to say that I have a certain baseline of articulation I want to see. I want articulation for all limbs – it doesn’t necessarily have to be ball joints (like Ash from Evil Dead II), but I want a good range of motion. For example, I was fine with the upper articulation on NECA’s Terminator figures, but the lack of leg articulation was a huge disappointment. Gipsy Danger features what I consider the most desirable joints on an action figure: a ball-jointed head, ball-jointed shoulders and hips, and ball-jointed ankles. Yes, I would have liked a bit more articulation – swivels at the biceps and upper thighs, for example – but this is figure is hardly disappointing to me in the articulation department. Accessories: None, and that’s a shame. The original sculpt for this figure had open hands, and I think we can all agree it should have come with a cargo ship. Quality Control: There’s a part of the sculpt, just over the right hip on my figure, that’s bent. I haven’t been able to get it to straighten out. Aside from that, I found Gipsy Danger to be quite durable. She’s fallen from a six-foot bookshelf onto a laminated floor a few times and hasn’t had a scratch. Overall: Some collectors are clearly disappointed with these figures. I understand where the critics are coming from, though I was far more disappointed with the paint than the articulation. I can’t deny it’s an average figure at best. But I still like Gipsy Danger. It’s one of those figures I find myself pulling off the shelf and messing with frequently, rather than just posing it once and forgetting about it. It’s not NECA’s best work – the articulation is decent but limited, the paint is sub-par, and there are no accessories. It seems clear NECA is proceeding cautiously with this line, perhaps due to their experience with Prometheus, which proved to be a dud with fans and consequently pegwarmed in the toy aisles. 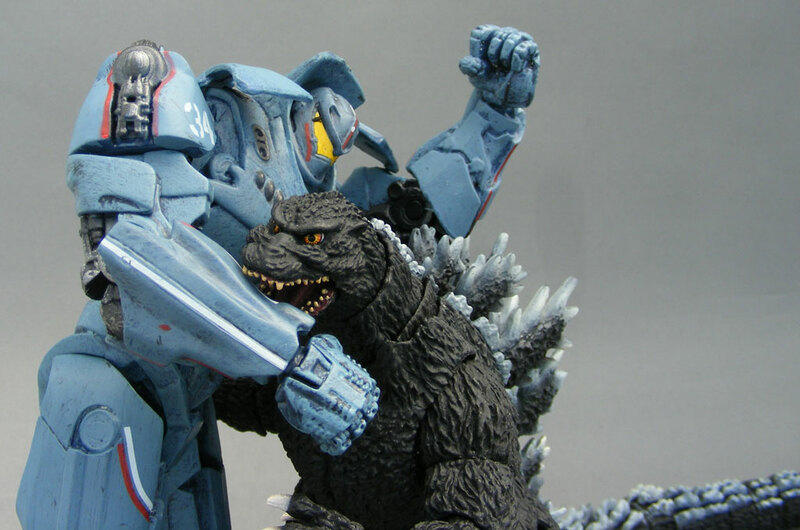 I suspect that won’t be Pacific Rim‘s fate. Reviews are pretty good so far, and the figures have been selling well even before the film comes out. 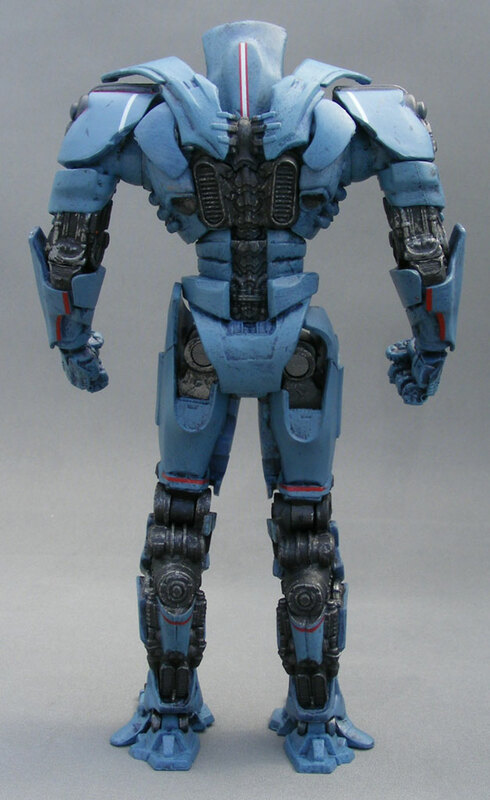 If the line continues to be popular, you can expect NECA to put more money and effort into future figures – perhaps even a new, better-made version of Gipsy Danger. I will be very bummed if this line ends before I get a Cherno Alpha. Oh, and for the curious: Gipsy Danger doesn’t really work alongside S.H.MonsterArts, as he’s too tall at seven inches (the S.H.MonsterArts figures top out around six inches, and the monsters in that line are supposed to be about 100 meters tall, whereas Gipsy Danger is only about eighty meters). As it happens, the Knifehead figure actually does work with S.H.MonsterArts, as he’s both a bit shorter than Gipsy Danger and is supposed to be 100 meters tall – which means Knifehead is very out-of-scale with Gipsy Danger, one of the entirely legitimate criticisms leveled at this line. 1 The title is definitely weak. “Pacific Rim” evokes absolutely nothing in your average person except perhaps a vague recollection of high school geology. If one knows anything about the plot, “Pacific Rift” would have made more sense and evoked more of a sense of science fiction and conflict. I’m not saying that’s the name I would have gone with had I been in charge – it’s just a quick pitch off the top of my head, and I still think it’s better than Pacific Rim. 2 In the fiction, Jaegers are referred to by the female pronoun in the convention of naval officers referring to their ships or submarines. 3 Cohen, David. 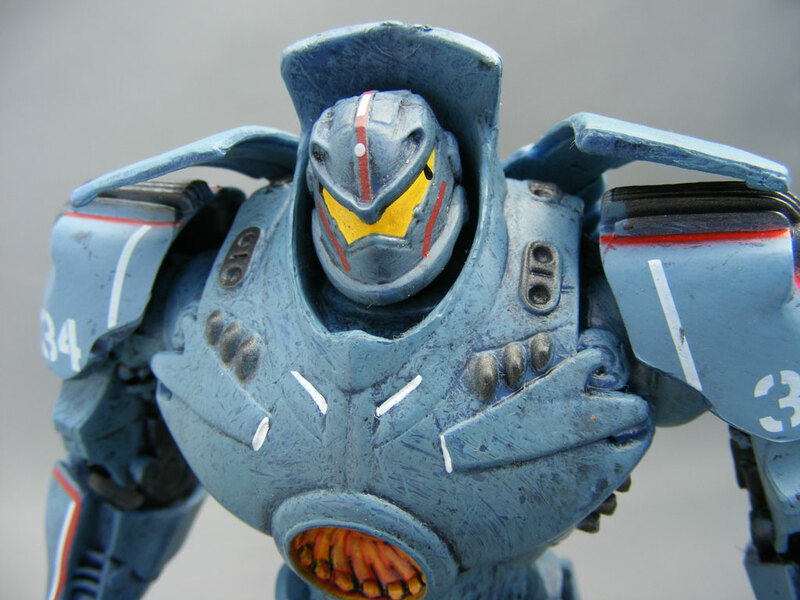 Pacific Rim: Man, Machines, and Monsters. 1st ed. San Rafael: Insight Editions, 2013. 60. Print. Sorry, WordPress has been a little weird lately. Pics restored, and yes, there are a few with SHMA Godzilla! The problem isn't a lack of articulation. Gypsy Danger has pretty good articulation. The problem is that most of it you can barely use because of the sculpt. The arms have ridiculously little motion overall and the legs, which should be fantastic, can kick backwards and that's about it. It's frustrating to fiddle with. I'd agree with that, which is why I said the articulation was "decent but limited" in my wrap-up. I still enjoy fiddling with her, but I agree it's a bit frustrating. But I'm not sure how much of that is NECA's fault, and how much is just the design of the character. I'll have to see the movie to get a better idea of that. There are all sorts of little things they could have done to improve this figure – added the "rocket elbow" in some way, given her the chain swords out of the gate rather than waiting for the battle-damaged version, given her the plasmacaster, and so on. The kaiju thing isn't my bag, and though I really liked Godzilla as a kid, I just can't enflame my nostalgia gland for Pacific Rim. I am glad fans of the genre get a decent-looking big-budget movie, and I'm sure I will enjoy it on blu-ray. As for it starting a franchise or becoming the "next big thing" ( pun intended? ), I'm not so sure. Does our culture want new IPs any more, or just keep recycling the ones from the recent past? The last movie that I saw in the theater before it became a huge hit, before the buzz even existed, was The Matrix, and I knew walking out of the theater that the film would resonate and be huge, but that was before the omnipresent marketing of social media told me that I should like it. Honest question here: how do people discover movies any more, and how does a film build a fan base quietly? Do we have to wait until hipsterismis no longer en vogue, and geek back to being derogatory? As for the toys, I am surprised at the inconsistent quality of NECA's work here. After your Aliens Xenomorph review I opened mine up and was extremely impressed with everything about the line. Aside from having to boil and reshape his leg and repaint Hudson's eyes (the skill those assembly line painters must have to do that, and the tiny brushes, must be amazing to see), I was very happy with the product. I will always be wary of NECA joints snapping, but that is my price for amazing sculpts and paint. The paint on this figure is just terrible, and I want to get to a store to look at the rest of the line to see if this is the case universally. Yes, the paint is inexcusable. I rarely even try to repaint figures, but I might in this case. As for movies getting a slow build – well, first off, that may end up being Pacific Rim's fate if its box office is as bad as some are predicting. If it gets good reviews and is popular with fans but has a bad box office showing, isn't that exactly how cult movies are born? 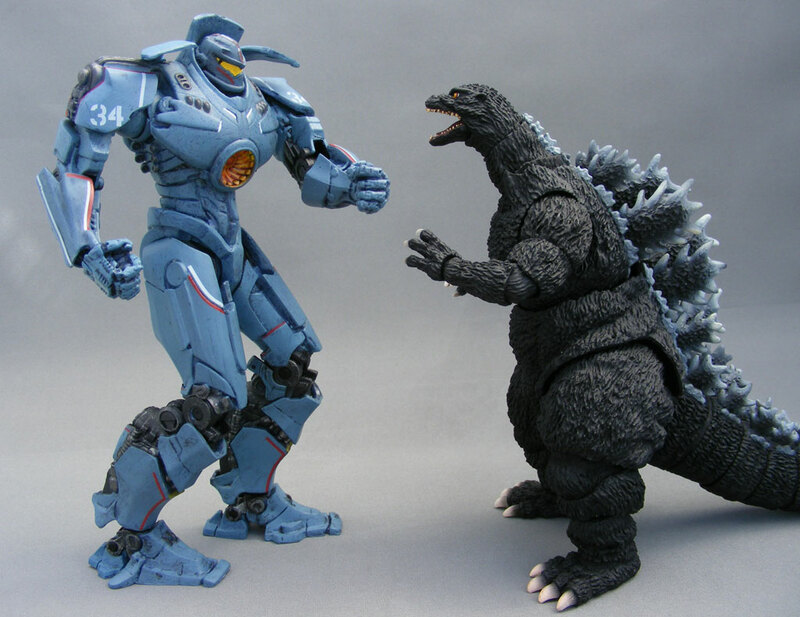 Anyway…the kaiju thing very much is my bag and, sub-par figures aside, I can't wait for PR this weekend. Yeah, that’s pretty much my opinion, too. They look good on a shelf, at least. Sure – it's S.H.MonsterArts Godzilla. You can get one here. Poe, I wish “Animag” or “Animerica” (both of which always had fine model/toy review sections) were still being published if only to print your reviews. You are a top-notch reviewer, sir. Why, thank you! High praise indeed, which is always appreciated! Well deserved, even if your review has clinched my fate and I must now purchase one of the figures for Young Mister Otaqueen. Pretty good review and I initially agreed with it about the design…however, Gipsy Danger's design is starting to grow on me because I can see now how it still manages to distinguish itself within this realm of really humanoid giant mecha's. I see the Striker Eureka design getting lots of internet love, but I think that one is too much Gundam imo… while Gipsy Danger really has a look of its own. The points where this figure falters a bit is where the design limits the articulation, such as the hip armor panels preventing wider stances. Should be easy enough to clip them a bit with a heated exacto knife.